WA Pilots win, Snake River airports open all year! SNAKE RIVER – Outdoor enthusiasts are getting some air-support that will help them reach their recreation hotspots this winter and next spring. *ed: The WPA/Spokane chapter stewards the Lower Granite (00W) airport spear-heading this effort to keep this unique and pristine area open. Disclaimer: Chapter President Tom Morris, is a friend of ours and a proud 18,000hr trans-oceanic airline guy, who is hanging his scrambled egg brim hat this weekend… Congrats Tom! 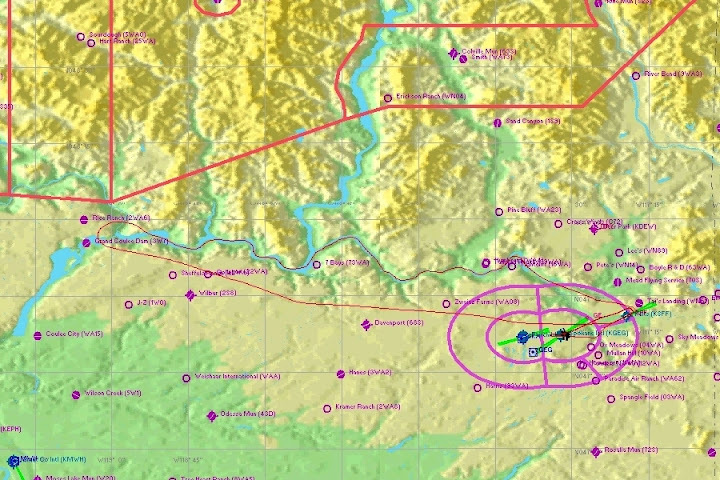 Washington State Department of Transportation announced earlier this week that the Lower Monumental, Lower Granite and Little Goose airports along the Snake River in Walla Walla, Whitman and Spokane counties, will remain open year-round. In past years, these airports have typically closed between October and June. 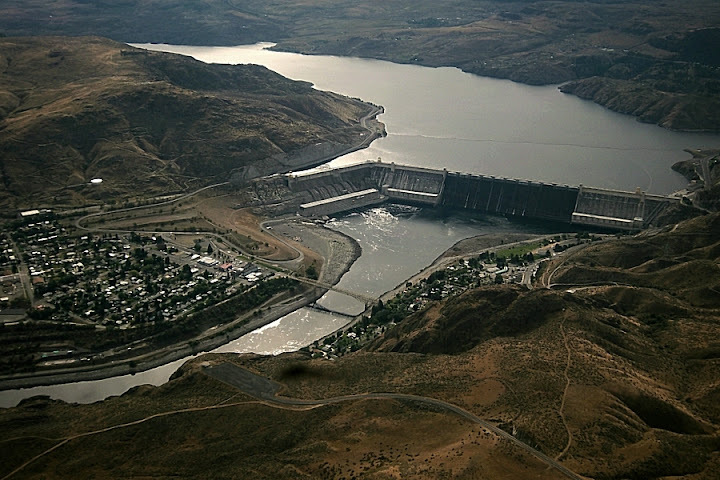 This changed after WSDOT and the United States Army Corps of Engineers (ACOE) weighed a number of factors, including expressed interest from pilots and recreational organizations. Nine of the 17 WSDOT-operated airports are currently closed for the winter due to typical snow accumulations on airport runways, lease agreements and state law requirements. And while the Lower Monumental, Lower Granite and Little Goose airports are not scheduled to close, pilots are reminded to plan ahead by reviewing the latest Notices to Airmen and checking WSDOT’s state-operated airports webpage for updated information about airport closures. 0430: I rush to the computer for the official Go/No-Go weather check. It’s POURING outside. But the radar also shows a rapid clear slot. Just then, “It’s a GO” beeps the phone with Paul on it, practically taxiing already. It had stopped raining completely by the time I finished my breakfast brick and quarter cup of half n half. 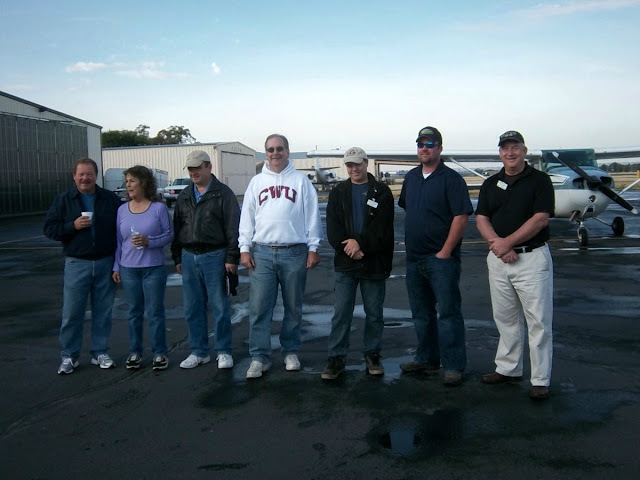 7 airplanes, 10 pilots, 20 vets and a couple very lucky by-standers took flight this year with Spokane Chapter WPA members. Carolyn thankfully gathered the real food, yummy SUBWAY (Jacob, our sandwich ‘artist’) and everybody at WESTERN AVIATION very kindly donated their hangar. Meanwhile, I bump into Terry and Dana at Spokane Airways and didn’t even know they were taking part! This is going to be a good day. Touching down on the still somewhat-glistening Runway 3L at Felts Field, Paul was already in the pattern doing those touch n’ goes ‘Just working some bubbles out of my new right strut’ he says. 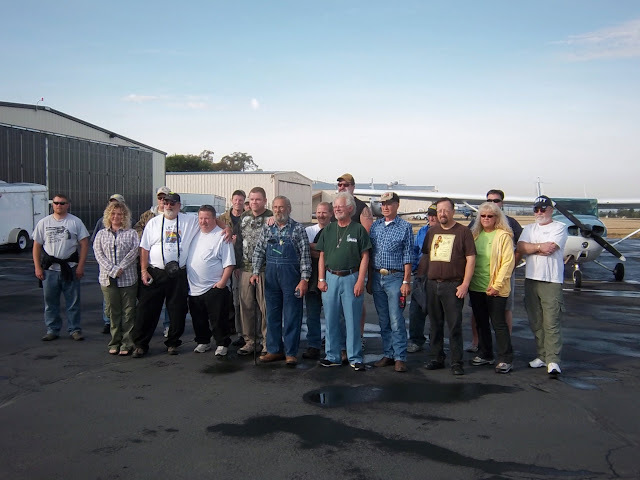 Pilots Tom Morris, Marian Heale, Dana Newcomb, Gary White, Geoff Scott, Paul Vietzke, Terry Newcomb and Dan Melville enjoy a dry spot on the ramp at Felts. Silverwood is building what appears to be a new high-speed/volume teardrop shaped park entrance off Highway95. Big enough to land a small Citation on. Eastern slopes of Lake Coeur D’Alene: Engulfed by smoke. To the extent made a quick call to Spokane approach; “We didn’t just fly into a new TFR, did we?” Thankfully, we had not. V.A. Director Pam Wick; “Most of these vets have never done anything like this before and they were so excited and thrilled to have gotten the opportunity. …Thank you for your time and generosity, and know we truly appreciate all the pilots involved.” Left with a smile a mile-wide, I now think how thankful I am, to be able to share such feeling of freedom as flight, with these true heroes who dedicated their lives, protecting ours. We salute you! 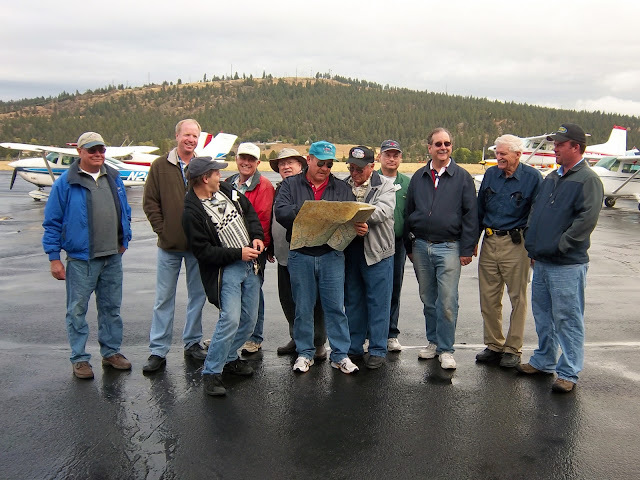 Spokane area veterans take flight with the WPA. One thing about the annual WPA Veteran’s “Fall Foliage” flight; we never know what the flying weather will be like on the third weekend of September, until we get there! 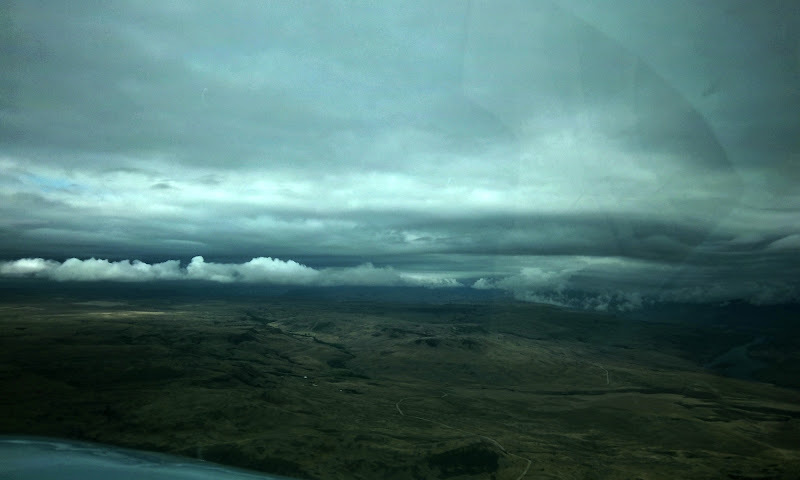 Even as I awoke at 3AM to drive up from Clarkston to pick up Dave and the 172 for a 0900 rendezvous, the radar peppered with cauliflower patches of brightened green and orange along our “normal” intended route up the Idaho/Montana border. Outside, the rain pounded our metal roof between nearly continuous deafening claps of thunder. “…We’re not going flying, TODAY” I thought. Then, looking again, I noticed a clearing line rapidly developing over the L/C Valley and confirmed it with a quick glance at the Satellite view. There WAS a chance we’d have a “window” after all. 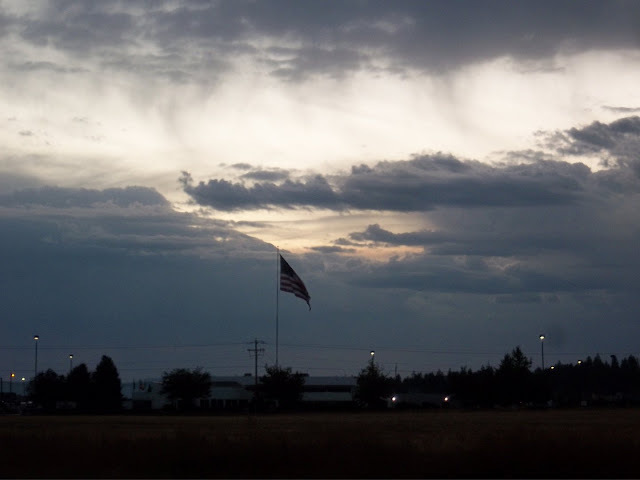 So, in the 4:30AM darkness, I chased the back-end across the Palouse, catching up with the rain again at Rosalia… IF the GO-NO GO was going to be a last minute call between all of us, at least I’d be there to be GONE or NOT-GONE. The windshield was still lightly beading as we touched-down on Runway 3L at Felts and saw the group of Pilots & veterans already assembled on the Western Ramp. Pam Wicks (of the V.A.) had brought an “eager” group of guests this year~ one route or another; we would not let them down! It was agreed conditions were looking better to the West, so, we chose the Spokane River route. Low ceilings kept our initial leg to around 4,000’ and working just out of the boundary of Class “Charlie” airspace presented some unique “ATC Challenges”, with controllers watching a string of aircraft pass across their screens. This marked the first time I was honored to fly the tour as “P.I.C.” and it would also become my first “Declared” (very loose) FORMATION and how exciting that was, when ATC asked us kindly to switch off the Transponders of the non-leading aircraft. We would be handled as “one” aircraft. Our guests found it equally as exciting, with constant radio-chatter between the aircraft, maintaining separation and pointing out interests along the route down the river. (*I’d always wanted to fly that route) Over Long Lake, Nine-Mile, Seven Bays, and down the Mighty Columbia all the way to the Gran Coulee Dam! Lots of happy smiles and thumbs up from the backseat of our aircraft, anyway. 22 Passengers, in all, flown in 9 aircraft for the 212nm trip, making just a tad over 4,400 “passenger miles” flown! Coming back into town, ceilings greeted us at 1,400’ so we were very thankful mother-nature had given us such a perfectly timed window of opportunity before the radar again would light-up for the afternoon. Carolyn had all the fixings setup as the Vets were treated to “Hangar Lunch” courtesy of Subway, stories and friendships exchanged. Bonus: even our “ground support” Chris Wetherell of ARFF (an aspiring young aviator himself) got to “tag along” for the ride; Nobody seemingly to care, that we hadn’t seen a spot of “foliage” along the entire ride.